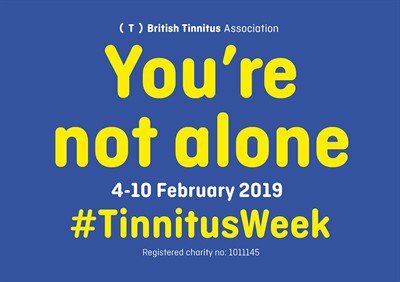 From 4 - 10 February 2019 the British Tinnitus Association will be holding its annual Tinnitus Week. The charity regularly speaks to people with tinnitus about how alone they feel with the condition, so the theme of this year’s campaign is Tinnitus and Isolation. British Tinnitus Association Chief Executive, David Stockdale says: “When people hear the word tinnitus, they tend to only think about the condition’s main symptom – the noise people hear in their ears or their head. However, the wider impact tinnitus can have on people’s lives is less understood by the public and GPs alike. Many people feel isolated and unable to talk to their loved ones, friends or colleagues about their condition and we want this to change”. To find out more about the British Tinnitus Association visit their website.